Every family has a story. Every story, eventually, must be told. For most of their lives, Julian Perel and his sister, Paula, lived in a house cast in silence, witnesses to a father struggling with a devastating secret too painful to share. Though their father took his demons to the grave, his past refuses to rest. As adults, brother and sister struggle to find their voices. A scientist governed by numbers and logic, Julian now lives an ordered life of routine and seclusion. My father gave up his language and his homeland. But he carried his sadness with him, under his skin. It was mine now. In contrast, Paula has entered the world as eagerly as Julian retracts from it. An aspiring opera singer, she is always moving, buoyant with sound. Singing was the only gift I could offer to my father. I filled the house with music. I tried to give him joy. . . . Yet both their lives begin to change on a Wednesday, miercoles, the day that sounds like miracles. Before embarking on a European opera tour, Paula asks her housekeeper, Sola, to stay at her place–and to look after Julian in the apartment above. Yet Sola, too, has a story. I want to clean myself like the window of a house, make myself clear for things to pass through. Flat and quiet. As Paula uncovers pieces of her father’s early life in Budapest and the horrifying truth of his past, Julian bears witness to Sola’s story–revelations that help all three learn how to both surrender and revere the shadows that have followed them for so long. 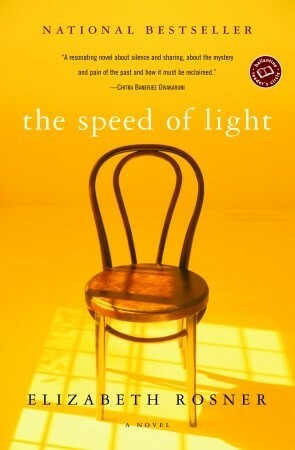 The Speed of Light is a powerful debut about three unforgettable souls who overcome the tragedies of the past to reconnect with one another and the world around them. In an extraordinary accomplishment, Elizabeth Rosner has created a novel of love and redemption that proves the pain of the untold story is far greater than even the most difficult truth. "[AN] IMPRESSIVE DEBUT… As witnesses, [Rosner’s] characters move forward, healed or not. They tell the truth, share their pain, and prop each other up. It seems there’s a lesson there for us all." "AN AFFIRMATION OF THE GOODNESS OF LIFE… The author of The Speed of Light possess[es] the soul of a poet, so rich is the texture of her language, so filled with music [and] and imagery." "A HAUNTING TALE OF TIMELESS SECRETS AND TIMELY SALVATION… A spellbinding tribute to the revelations that redeem us and the emotions that ennoble us." 1. THE SPEED OF LIGHT features three very distinctive characters and their struggles to overcome the difficulties of their past. Which character did you relate to the most? And why? 2. The novel ends with each character on the brink of a new discovery. What do you imagine happens after the end of the book? What do you think the future holds for Sola, Julian and Paula? 3. Compare and contrast how the presence of color, scent and sound informs the lives of Julian, Paula and Sola. 4. Certain metaphors recur throughout the novel and have thematic as well as structural significance. For example, the metaphors of breaking into pieces and unraveling appear for all three characters, and this imagery is also reflected in the frequent alternation of point of view. The result is an impression of fragmentation, which also sets the stage for the interweaving of the characters’ lives. Can you find other examples of repeating metaphors and their effects in the novel? 5. The pivotal role of science and scientific language in THE SPEED OF LIGHT is not only apparent from the book’s title, but also Julian’s science dictionary literally becomes the novel’s fourth voice. What were your impressions of the definitions? Did any of them strike you as particularly resonant in your understanding of the characters and/or the book overall? 6. In the novel, bearing witness to tragedy implies a responsibility held by both the person telling the story and the person listening. How do you think these responsibilities differ? Do you agree with Sola that each role is important in the healing process? Do you think this idea is applicable to the world today? 7. Did any of the characters or scenes from THE SPEED OF LIGHT stay with you after you finished reading the book? If so, which ones and why? 8. The bonds of family are a central theme in the novel – both the secrets and silences that arise as well as the close relationships formed between parent and child, brother and sister. Are there any feelings in the book that resonate with your own family experiences? Do you think this kind of complexity is common to the American family today? 9. During the course of the novel, each character experiences a significant change and ends up in quite a different place than he or she expected. Did you, as a reader, find the book altered any of your perceptions or experiences in the world around you? If so, discuss these changes and the feelings they inspired.